I have recently been reading the blog of my dear friend, Tiffany, and realizing, with a wow, that I am not sharing like I used to. 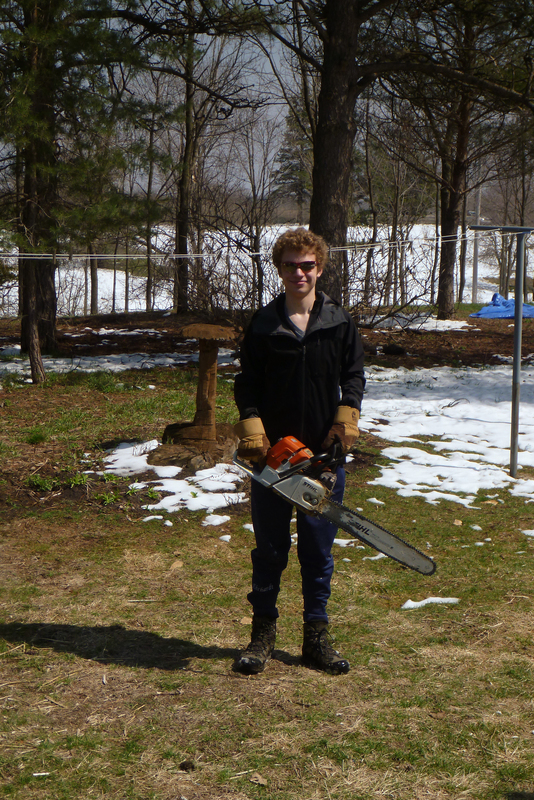 With my gardening project and then some occasional and seemingly random musing. And, you know what? As I was reading her words I really started to miss that process. I have been constantly trying SO hard to come up with things to say that are meaningful or helpful, I mean so hard that I stop, and the truth of the matter is that I can just write. People will be interested or they won’t and I get to have fun with words and photos. That simple. Woo Hooo! I am totally celebrating Tiffany today for rekindling my fire. And my gardening spirit for that matter! The above picture is a little of the aftermath of last week’s freakish May snowstorm that, between two days, left us with something like 16″ of wet, heavy snow – glacial blue in hue… I have determined this to be because of how wet it was that the light was refracted in this way, which was at once both beautiful and slightly disturbing… why is the snow the color of glaciers???. The above tree fell down right next to the house. Tom was sitting in the easy chair beside the window when she came tumbling down. So sad. 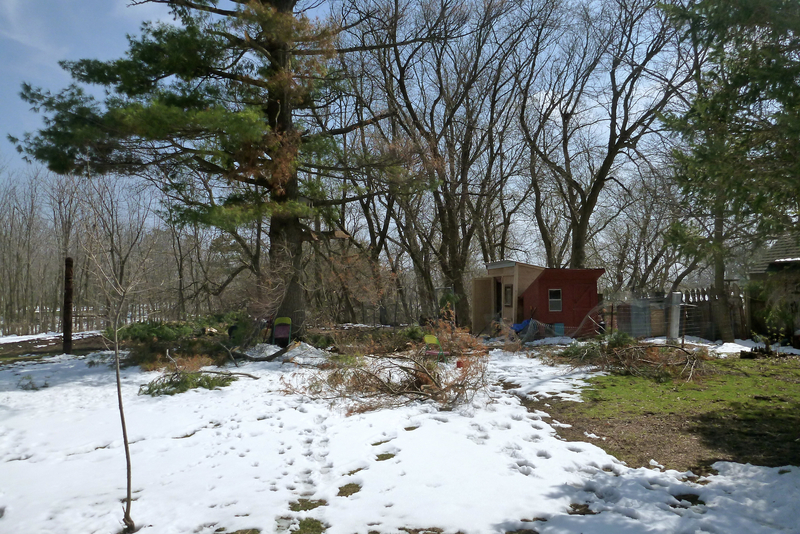 The white pine (below) in the back, she did not fair much better, but she was really in rough shape prior to the storm and we both agree that this actually seems to be an improvement aesthetically. I am saddened by the loss of the swing. Fortunately the chicken coops were spared. The pen’s fence did not fare so well. It is the season for the hens to be free ranging anyway, fortunately. They like the run of the place. They get it until they start picking on the garden. 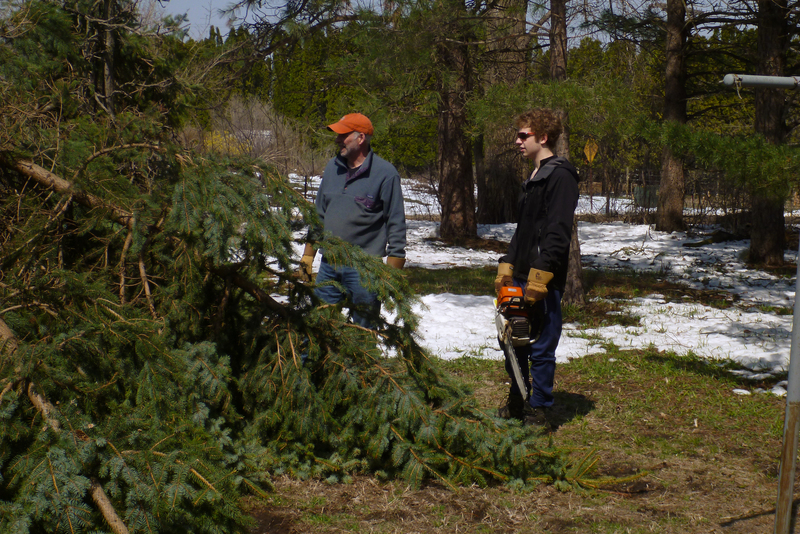 The storm provided the perfect opportunity for a little Chainsaw 101 for Tom and Andy, since he hadn’t ever had the experience before. As one familiar with wielding that equipment, I feel that he did quite well his first time out. He and Tom both have a ways to go in their pile making acumen, however. Perhaps we will bring Daniel and Meg up from Kansas City to teach Wood Piles 101… they are good at them! Last week was one of those “Only in Minnesota” weeks, of which, Minnesota could easily be substituted with, say, Iowa, or Alaska, or Canada. 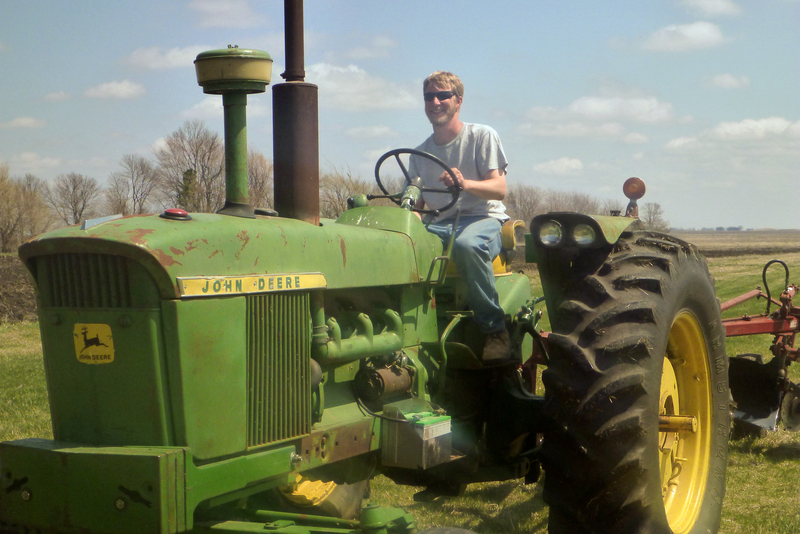 On Monday I was out on the tractor for the first time in two years turning the dirt black. I definitely got some sun, with tan lines to prove it. Thursday, well, you have seen the evidence, I don’t need to do any more reminding. 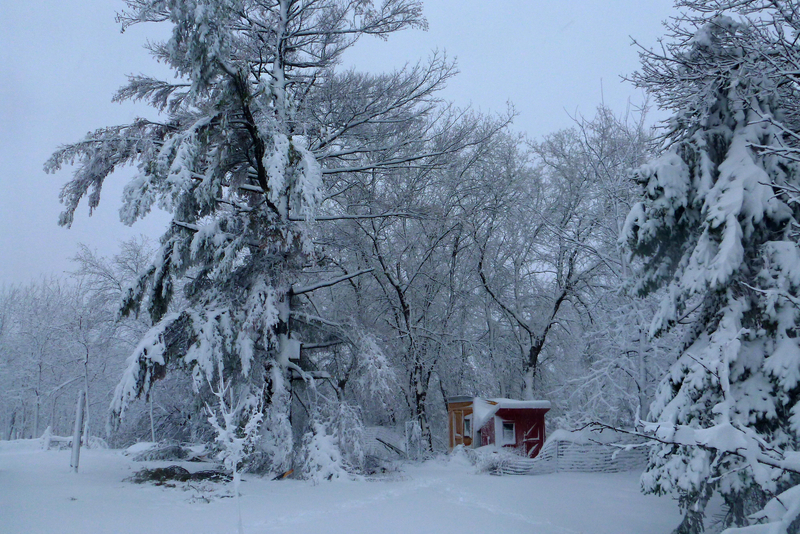 Prior to this dump, the last two snows I had said, “Well, I think we ought to be in the clear now,”… I am not saying that this time. For all I know, it’s going to snow in June. I might just keep my long underwear out all year long. To ward off cold temps if nothing else, to be prepared for them at the least. 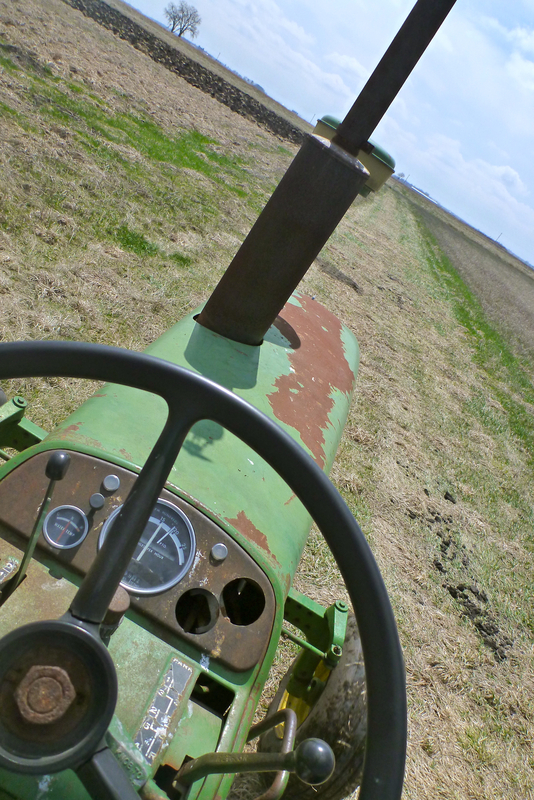 It is a bit embarrassing to admit how LONG it had been since I have been farming… as in, actually driving a tractor. I had to have Seth make the first round with me because I couldn’t remember the controls. Thankfully it came back to me. And the most important part, how to make straight rows, also came back to me. Pick a point far off on the horizon that you know you are never actually going to reach, line up the hood marker with it and keep your eyes on it and your ear on the engine so you know if the plow is plugged. Viola. I thought, you know, that is pretty applicable to life, too. Pick that far off thing to set your course even if you never get there, you will at least be taking the most direct route. The other added bonus to being out on that ground was feeling my dad’s presence so close. Like he could have been in the house having a Coke checking up on the weather. My heart felt good all over. More bees! Our neighbor, Joe, picked up two more packages of bees for us on Saturday. These are Italian bees. Andy helped Tom install them while I was out at the barn with my horses. He said it went really well, that the bees were calm and they (the people) didn’t over-analyze everything. Tom only got stung once, and that was while carrying the boxes from the dining room (where they spent the night) to the hives. He tried something that a friend of his had recommended for the sting, because he got stung three times with the Buckfast bees a couple of weeks ago and that was miserable. Just take loose tobacco and chew it into a poultice, then tape it on. Worked like a charm! 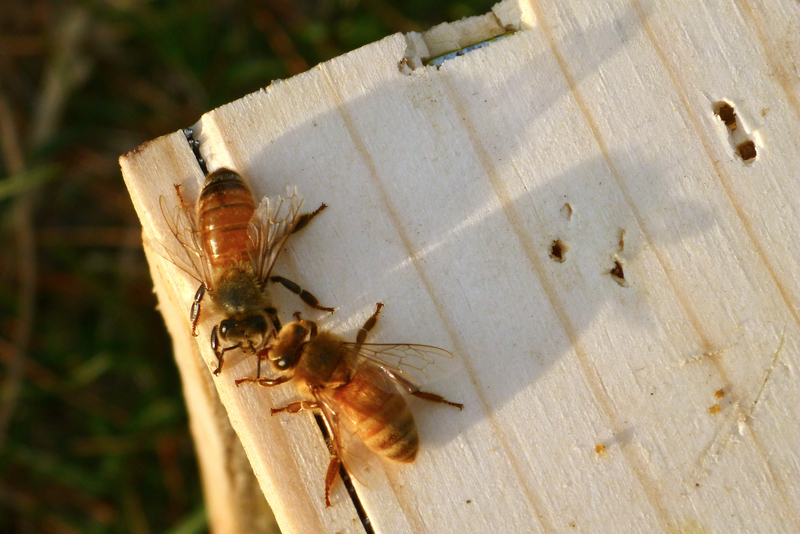 We have a new bee sting remedy that is tried and true! 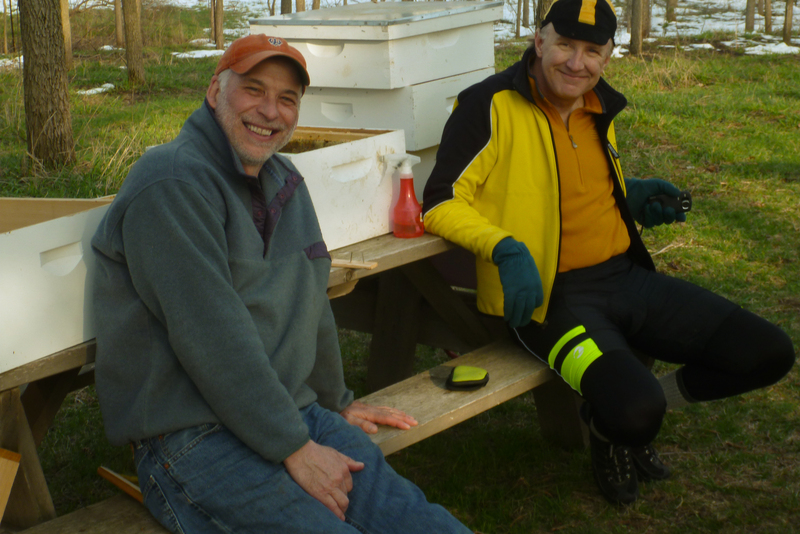 Tom has been going to the area bee keepers’ meetings in Rochester, and has gotten to know a couple of super people. Clinton and Randy. Clinton rode his bike in yesterday just in time to hang out with all 5,000 of our new friends. I think he was trying to impress them with his attire. Another wonderful day of horse training. The arena is a little dusty, but it is better than working in a lot of mud, which is my alternative. 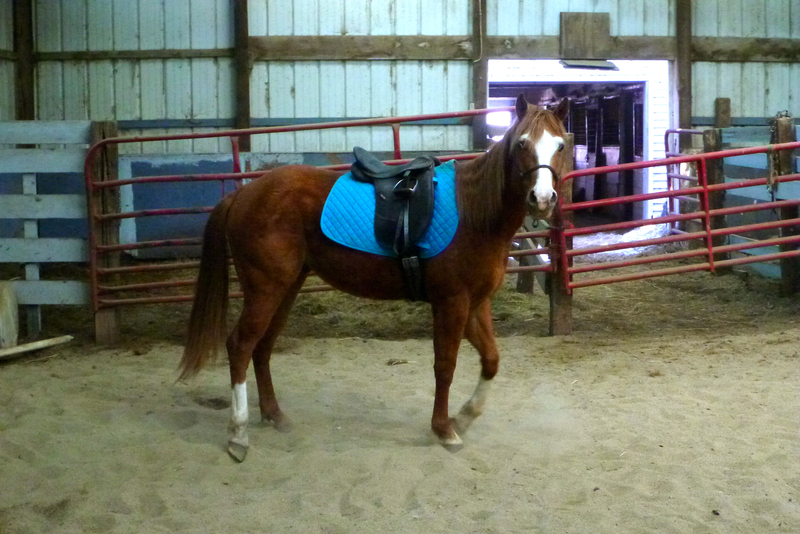 This is Jeffrey showing off our new saddle and very stylish new saddle blanket. Longer stirrup leathers are in transit, which my legs will appreciate greatly! I was finally able to give him his vaccine that I was really nervous about. I mean, not as nervous as I would be should he end up with something dreadful like West Nile, so that is why I just did it. He hardly even flinched. I think I timed it right when I did it following grooming and a rub down. I suspect the latter is why he always comes to me so willingly. He is such a sucker for a good massage. He has been wonderful to ride lately. We recently added cantering with a rider without any incident. 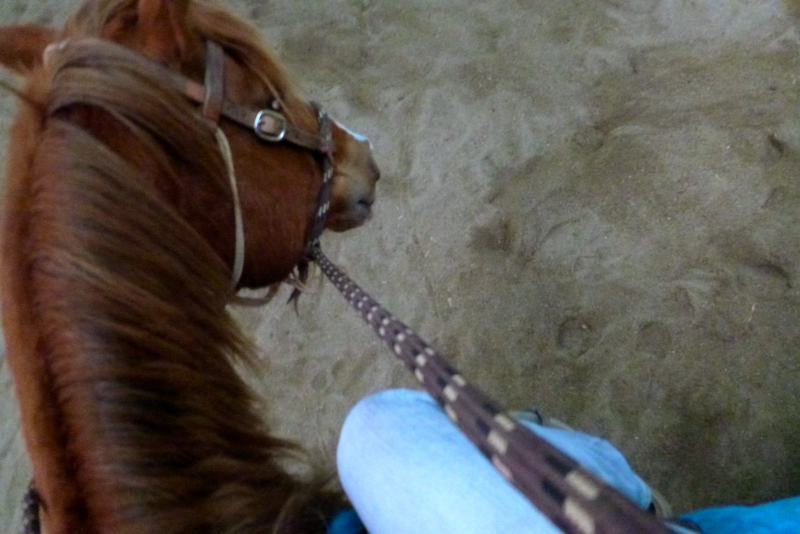 He has such nice and easy gaits, doesn’t get too worked up. He just turned 4 in January and is definitely in a growth phase, too, as without the saddle on he is looking gangly and misproportioned. I think as I work to get him in better shape that will help, too. This is the view from his back.